Quick, hand drawn wireframes can provide substantial benefits that will save you time and money. Wireframes have become an intrinsic part of the way we work at Headscape. In this post I want to explain why we are so enthusiastic about them, and how we use them in our process. 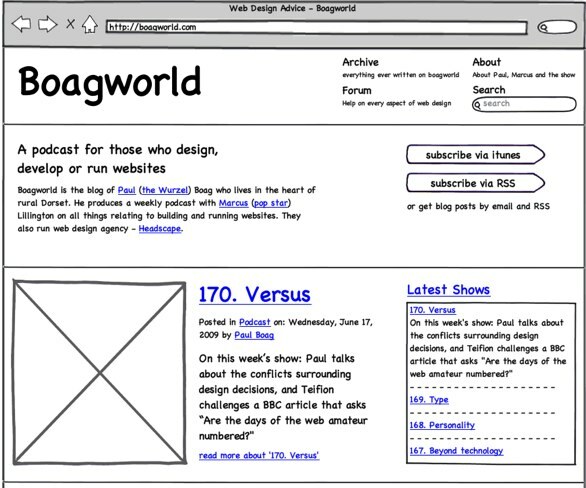 However before we do that, let’s take a step back and look at exactly what we mean by wireframes. It is easy to think of wireframes as HTML prototypes of an entire website (or at least key sections). Although this is certainly one type of wireframe it is not the one I wish to focus on. The problem with HTML prototypes is that they are time-consuming and expensive. Building a functional prototype takes a lot of work and in most cases is discarded once the final build begins. Unless you can find a way of turning your prototype into a working site, this strikes me as a waste of resources. In my opinion, this cost precludes their use for anything other than the largest and most complex project. However, wireframing does not need to be like that. At Headscape the vast majority of wireframes are hand drawn sketches. For us wireframing is not just the responsibility of a designer or user experience expert, it is something everybody participates in. We will regularly bring together designer, developer, project manager and whoever else is involved in the project, to wireframe key functionality. This is valuable because it improves team working and helping each member to better understand the role of others. It is also an excellent way to breaking the waterfall model of running projects, where each team member essentially works in isolation handing off work to the next person. These group wireframing sessions not only improve team working, but also communication. We used to suffer from a problem where developers were not included early enough in the project cycle. This led to functionality being promised that was difficult or impossible to build. By including everybody in the wireframing process this problem has been eliminated. A developer will quickly spot issues in a wireframe that may be missed if buried in an email thread or functional specification. That is the beauty of wireframes. Because they are visual it is much easier to grasp what is being proposed. Specification documents and emails are fine, but they are harder to visualise and perceptions can vary. Wireframes leave much less room for misunderstanding. Of course, wireframes do not just improve communication within your own team. They also improve communication with the client. Engaging with the client continually throughout a project is vitally important. This is especially true when it comes to visual design (see The Battlefield of Design: Designers vs Clients). A client who has seen a wireframe and has been given the opportunity to provide feedback is more likely to sign off the final design. With some of our clients, we go even further by including them in the wireframing process. We have found that with the right client this can significantly increase the quality of work. What is more, it gives the client a sense of ownership and engagement which invests them in the final design. Another huge advantage of hand drawn wireframes is how easy they are to produce. When all you need is a pen, some paper and a few seconds to sketch something out, it becomes liberating. It lets you explore many more approaches than full comp production allows. Much of our approach is based on Leah Buley’s presentation at this years SXSW. She encourages the production of a wide variety of wireframes tackling the problem from many different angles. We will produce wireframes aimed at different user groups, different levels of expertise, and with emphasis on different business objectives or brand values. The aim is to generate as many ideas as possible. Once you have established a wide variety of approaches, you can refine, discard and combine them until you have two or three that could work. It would be impossible to explore this number of different approaches in any other way. Once you have two or three wireframes with potential, the next step is to test them with real users. establish whether you have the right visual hierarchy. Obviously testing against a hand drawn wireframe is not as informative as testing against a final site. However, it does enable you to identify problems before too much time has been invested. The problem with user testing a final design, HTML prototype, or worse still a completed site, is that a considerable amount of work has already been done. This makes it hard to change. The same is true if a client rejects a finished design. Hours of work have gone into that design and the designer feels committed to that approach. There is a substantial cost in starting again. This is not the case with hand-drawn wireframes. Because they are quick and easy to produce, it costs nothing to discard them and try another approach. This willingness to change makes you much more responsive to the results of user testing and feedback from the client. Finally, although wireframing in this way takes a small investment of time and money, ultimately it brings cost savings and prevents slippages. 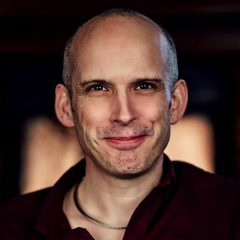 The developer has been involved in wireframing and so isn’t surprised by unforeseen functionality that might increase costs and extend timescales. The client has seen the wireframes and so is more likely to sign off the final design. This reduces the need for expensive iterations or multiple concepts. User testing is done earlier in the project and so changes can be made before significant development has begun. It is more expensive to change existing work than building it right first time. Wireframing upfront also reduces uncertainty in projects. It is possible to budget for, and schedule in, wireframing. However, it is much harder to do that for unforeseen complexity and multiple iterations. 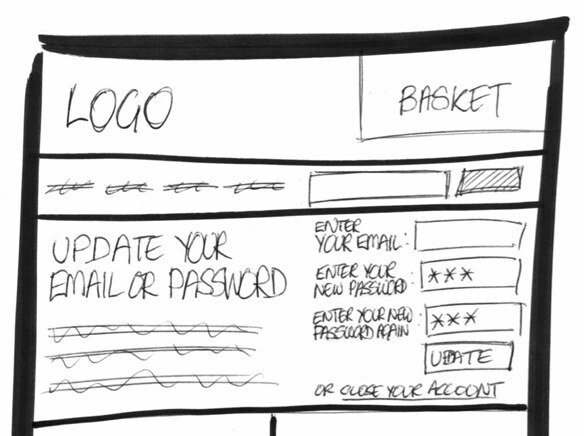 It is worth noting that hand drawn wireframes do come with their drawbacks. We have found that sketches can become messy and confusing once they have been drawn and redrawn based on feedback. This can lead to confusion and also lacks professionalism when presenting to the client. We, therefore, tend to take the final wireframes and produce a more finished version to present to clients. This becomes the definitive document that we work from. It is at this stage we also add more detail in terms of copy, making it a complete roadmap to work from. When we first started this process the final wireframes were very polished. However, we discovered that this caused confusion among some of our clients who mistook these for final designs. We also found that producing these was time-consuming and so undermined the benefits of hand drawn sketches. Finally, we have settled on a tool called Balsamiq for producing finished wireframes. The reason we like Balsamiq is that it is amazingly quick to produce a wireframe, but also still looks like a wireframe rather than a finished design. Too often we begin the design process by opening Photoshop. However, although Photoshop is a powerful tool, it is the wrong place to start. It is a sledgehammer to crack a nut. You may shy away from sketching wireframes because you cannot draw. However, this is not about artistic ability. It is about quickly and visually communicating ideas. Wireframing should be fast and furious, and I actually believe that artistic ability can make you overly precious about the quality of your sketches. Hopefully, this post has communicated the benefits of hand drawn wireframes and encouraged you to close your MacBook and open your sketchbook.